Stealthy masters of the dark. They creep about in the night, dispatching their victims without thought. They are masters of stealth, the martial arts, and various hand held weapons. Those they hunt fear the night and try to protect themselves with guards in utter futility. Find them in the Feudal Japan Section of the Victory Store. Part of over 1000 figures available from Victory Force. This pack is one of my favorite packs he sculpted. 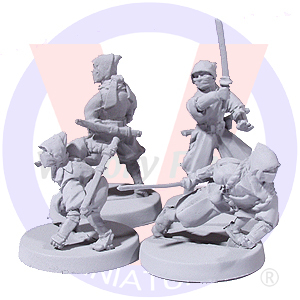 This entry was posted in Spotlight and tagged 28mm, feudal Japan, spotlight. Bookmark the permalink.